Fr. Brian Mullady's exposition on morality, and a clear refutation of systems that contradict the Church's teaching. 262 pp. Paperback. "A faithful Dominican and true son of St. Thomas Aquinas, assists the reader in a proper Thomistic foundation in moral analysis. He restores the sense of tradition, establishing a confidence for those seeking right moral judgements. Father Mullady challenges us to understand God's love for us and calls us to be both servant and free." The Most Reverend Jerome E. Listecki, Archbishop of Milwaukee. "Puzzled theology students, busy priests, inquiring layfolk, all need a complete but manageable presentation of the principles of moral theology. Fr. 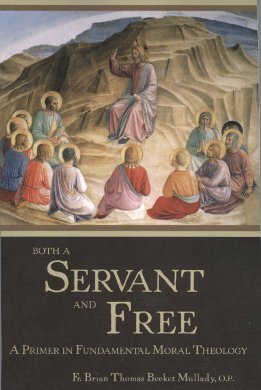 Mullady's work answers this need, and does so effectively by offering not only a positive exposition of morality, but also a clear presentation and refutation of the principle moral systems which currently contradict the Church's great theological tradition and her Magisterium, be they from left, right, or center. This is the strong point of Both a Servant and Free, one which can come to the relief of many a student who otherwise might be led in the wrong direction." The Very Reverend Hugh Barbour, O. Praem., Prior, St. Michael's Abbey, Orange, CA. This is the subject of the author's series on EWTN.